CoCliME brings climate services to 4th International Symposium on The Effects of Climate Change in the World's Oceans in Wahsington, DC, USA, June 2-8, 2018. Leading researchers from more than 50 nations gathered in Washington, D.C., to discuss the latest science on climate change impacts on ocean ecosystems. Recognizing the ocean's valuable contributions to people, economies and nations, the 4th International Symposium on the Effects of Climate Change on the World's Oceans (@ECCWO) provided a unique forum for scientists and experts to share information, highlight activities, build partnerships and shape the future of this important field. The ERA4CS project Co-development of Climate Services for Adaptation to Changing Marine Ecosystems (CoCliME) was represented by Elisa Berdalet, harmful algal blooms (HABs) were conceived as a Jungian Mandala composed by multi-connected bricks. 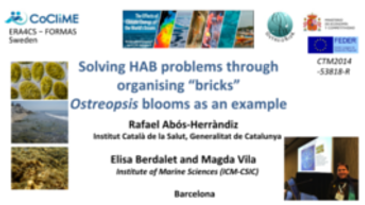 Solutions to mitigate the negative effects of HABs can be found by identifying the different "Mandala building bricks", their twofold cause and solution roles and, the connections among them. Two main kinds of bricks are at play: the natural dynamics of the microalgae in the habitat and the different human actors including directly affected end users, forcing activities, health systems, scientists, funders, policy makers and mass media. Identification of the Mandala building bricks determines their appropriate monitoring and helps to prioritize prevention and mitigation of the impacts of HABs, and ideally their occurrence. This approach applied to the particular case of Ostreopsis blooms. Human intoxications due to aerosol inhalation in certain Mediterranean beaches affected by Ostreopsis presence and/or proliferations have been reported in the last two decades. The presentation constitutes a conceptual approach to address the CoCliME research goals and approaches concerning the effect of climate change on HABs dynamics in European waters. This information is used to co-develop relevant climate services for end users such as shellfish farmers, tourists, health and environmental agencies, to prevent and adapt to the impacts of HABs in future climate change scenarios.